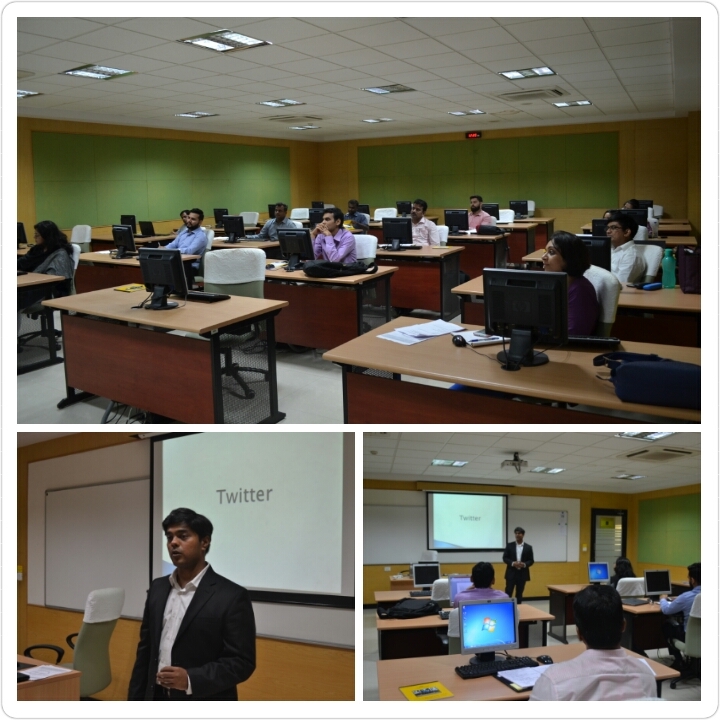 About The trainer: Ananth V has conducted training for 8,000+ participants across Top Corporate & Elite academic institutions on Digital marketing and Social media ROI. This will be a hands-on case study based training. At the end of the course program, the trainer will provide a Certificate of participation and successful completion of the program under Techdivine Creative Services and under the Trainer's name. Certificate will be provided only for participants who have attended all 4 days of training. Such participants will also get access to exclusive content reading material on our blog with special VIP password access. Venue: (Our Training programs are conducted across any of the following 4 locations in Mumbai: BKC, Andheri, CST or Bandra). We will finalize the venue depending on the location from majority of the participants. But it will be in one of the above mentioned locations in Mumbai only. EARLY BIRD DIscount for VIP all 4 day access: Use code: AUG15 on or before 15th August 2018 and avail 15% discount on 4 Day All exclusive VIP access pass. Veg Lunch will be provided by us. Tea / Coffee will be provided by us. Internet wi-fi will be provided by us. Certificate of participation and successful completion will be provided by us based on the guidelines adhered to as provided by the tainer on successful participation. Certificate will be provided only for participants who have attended all 4 days of training and as per our guidelines. What is social media marketing and what is ROI? BRAND – What it means to the real world and how to HUMANIZE your Brand using Social media marketing. Blogging: Widgets, plugins, pathces and backup. Using Twitter as a BRAND and having real-time conversations with users, customers, prospects and brands. For Day 3 and Day 4: Pre-requisite: Participants need to have attended Day 1 and Day 2 of the above mentioned training workshop to ensure a smooth learning. If you have not attended the above two days, you need to ensure you have an advanced learning and understanding of the aspects mentioned in day 1 and day 2 as the process and topics are linked with each other. One Hands-on practical experience to test your skills at the end of the project. This will be based on participants overall learning speed and pace and will be a group based project to see and test the learning skills of the participants in creating a digital strategy. (It can be for any 1 day or any 2 days or all 4 days VIP depending on the ticket you have purchased). - 1 day: Rs.7,350/- (+ taxes + internet convenience fees charges by meraevents). - 2 days: Rs.12,400 (+ taxes + internet convenience fees charges by meraevents). - VIP PASS: All 4 days: with exclusive content access on our blog for reading materials and certificate from our end: 22,450 (+ taxes + internet convenience fees charges by meraevents). We will provide, veg lunch, tea, coffee and internet access for the participants. Participants need to Bring their own LAPTOPS for an immersive hands-on learning experience. In case you forget to bring the laptop we wont be able to guide you with the hands-on training experience. In case of any unforeseen circumstances and event cancellation by us (the ticket cost paid by you) will be refunded after deducting any internet or online fees or fixed event charges or tax charges incurred from our end and with the support of the site from where the courses are hosted online for booking. In case the participant, i.e. you are cancelling from your end on or before 1st October 2018, then a 30% cancellation fee will be deducted and balance will be refunded after deducting any internet or online fees or fixed event charges or tax charges incurred from our end and with the support of the site from where the event is hosted. In case the participant, i.e. you are cancelling after 1st October 2018, then a cancellation fee of 60% will be deducted and balance will be refunded after deducting any internet or online fees or fixed event charges or tax charges incurred from our end and with the support of the site from where the event is hosted. All decisions with respect to this event will be our final decision and will not be debatable under any circumstances. The trainer has complete authority over the decision making process during, before and after the training to ensure a smooth, professional and disciplined training experince for all the participants. We do not claim to offer any government authorised or recognized certification or guarantee of any sorts as part of this workshop and we hope you have a wonderful learning session. Veg Lunch will be provided from our end for both the days. Coffee / tea etc will be provided from our end. In case of technical issues from your end like unable to log in to the internet using our wifi or internet provided on your laptop etc, please note, we cant be held responsible for the same. In such cases, it is your responsibility to ensure you have a wifi hotspot access with you from your smartphone. Same goes for issues with your laptop, it will be solely your responsibility and we cannot provide laptops or desktop etc from our end under any circumstances. The Trainer and or his team may record and or click pictures and any and all content will be the intellectual property of Techdivine Creative Services and can and will be used across as per our discretion at any point of time across platforms, online or otherwise. Limited Seats available and we have already been pre-booked for few seats for this program. So, Seats filling really fast! Email me: ananthv@techdivine.com for bookings directly. For CORPORATE Booking or Bulk booking, reach us directly. This event is hosted by Techdivine Creative Services and Ananthanarayanan V.
Terms & Conditions: In case of any unforeseen circumstances and event cancellation by us (the ticket cost paid by you) will be refunded after deducting any internet or online fees or fixed event charges or tax charges incurred from our end and with the support of the site from where the courses are hosted online for booking. In case the participant, i.e. you are cancelling from your end on or before 1st October 2018, then a 30% cancellation fee will be deducted and balance will be refunded after deducting any internet or online fees or fixed event charges or tax charges incurred from our end and with the support of the site from where the event is hosted. In case the participant, i.e. you are cancelling after 1st October 2018, then a cancellation fee of 60% will be deducted and balance will be refunded after deducting any internet or online fees or fixed event charges or tax charges incurred from our end and with the support of the site from where the event is hosted.